What Cox engine is this? I bought this engine from a fellow who said it is a Cox QRC, but I have never seen a QRC with a red tank, red crankcase, and red spinner. The glow head has only two lower cooling fins, and is knurled around the center crown, like the late model high-performance head on the Killer Bee and Venom engines. Can someone help me put a reliable name on this engine? Is it a QRC? Suggestions appreciated. Re: What Cox engine is this? QRC comes with red fuel tank, at least I know. However I didn't see a QRC with a red crankcase. It’s not a QRC which would have had a throttle muffler, bare crankcase and a blue spinner. My guess it’s just an engine made up of different parts. Still a nice engine. I don't recall any QRC's with a red crankcase, although they may have existed. The QRC did not come with throttle. "Q" was for quiet, it was only muffled, but the factory retail engine did not have throttle. First retail throttled reedie was the R/C Bee in 1976, but 3rd party unmuffled rotating throttle sleeves were available in the early 1970's through outfits like Ace R/C. Some used these to retrofit engines for RC throttle use. It was intended for those who needed a muffled engine some 40 years ago, when most RC proportional flying was done on 2 channels. Radio flight packs were heavier then, except for special mini systems like Cannon that were more expensive, beyond an entry level RC hobbyist's budget. Thus, much flying was done unthrottled. The Airtronics Q-Tee and S-Tee by Lee Renaud are such kits available back then to make use of the QRC. Being unthrottled saved the weight of another servo and lessened current drain allowing use of a smaller and lighter nominal 4 cell 250 mAH nicad pack. There wasn't much difference speed wise under power or in power off glide of a half-A plane with a roughly 36" wingspan powered by a .049 Golden Bee or Babe Bee reedie. Integral tank gave a couple minutes flight, so throttle was a luxury. Our newer and lighter radio systems and smaller more powerful servos have made throttle more practical. The real QRC would have just had a muffler. No R/C control just was referred to as Quiet RC for 2 channel flight. commando*72, seems that you may have a reasonably high performance engine. For one, it comes with the higher compression Tee Dee head. Check to see if you have SPI (sub-port injection), there will be a gap between the piston skirt and bottom edge of the cylinder exhaust port when piston is at top dead center. Look into the sides of the exhaust ports under a good light. If it has dual bypass ports visible on each side with the piston down and SPI, then I'd say it probably has at least the higher performance of a Black Widow. If it has no SPI and dual ports, then you have performance equivalent to the QZ and QRC. It will still have higher performance than the earlier stock Babe Bee engines. 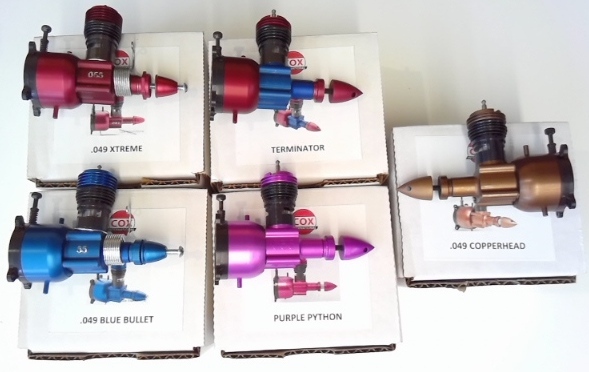 You may have a custom high performance engine on your hands that is not an original Cox factory product engine. It certainly has a very nice anodized finish. If color is reasonably true in the photographs, appears to be a slightly different shade than Cox anodizing. Back in the late 1970's and early 1980's, I flew a Sterling 36" span Minnie Mambo Cabin powered by an RC Bee engine, which was basically a throttled QRC (QRC was unthrottled) with cast crankcase, larger capacity tank and internal clunk for aerobatics. It was a good engine, more powerful than a Babe Bee. I have been emailing Don. The engine has a HD crank and a #4 cylinder. The only thing to change is to get a non vented black widow back plate for true stunt performance . Looks like a hot little engine. Anodizing looks good, the exhaust ports looks to be carefully positioned, zero drag driveplate (with thrust washer?). For some reason this engine reminds me of something offered by Leo Squiers (Stoneway Group), the site is no longer up and I don't think I have many pictures saved of his work. Jason_WI wrote: I have been emailing Don. The engine has a HD crank and a #4 cylinder. The only thing to change is to get a non vented black widow back plate for true stunt performance . Anyhow, I found this question entertaining as I work on Cox engines Most day's being retired. And have done so for what seem like a long time. Anyhow, I would suspect that the owner, as the engine looks to be in very nice condition, possibly changed out to one of the red crankcases, that were anodized, other than done by Cox. I checked them out as I do My own Anodizing, and it was basically a tumbler then into the anodixing tank. As I am not able to to really "See" The engine, I am unable to know for sure. are came on a couple different model's. I would get a good debuild kit and check out the inside, and the cylinder.Overall a Nice Engine.